Welcome, friends. Today I journey into the kitchen in search of a part of myself that has been largely absent since the day HungryHilary let me get married to her. Back in the era of my bachelorhood, I considered myself to be fairly competent. Not a skilled chef, by any means, but at least serviceable with a spatula and able to keep myself from starving. Such notions have now been put to rest by my most recent cooking venture, which shall be deemed the DocBotch. Bang Bang shrimp is an appetizer served at the Bonefish Grill, and it is delicious. It consists of multiple shrimps, breaded/fried and coated in a wondrous sauce that attacks your sensibilities from both the sweet and spicy fronts. Friggin yum, man. I heard from my hermano, Chris, that it could be created in the comforts of one’s own home with relatively little difficulty. I decided at once that it had to be done. 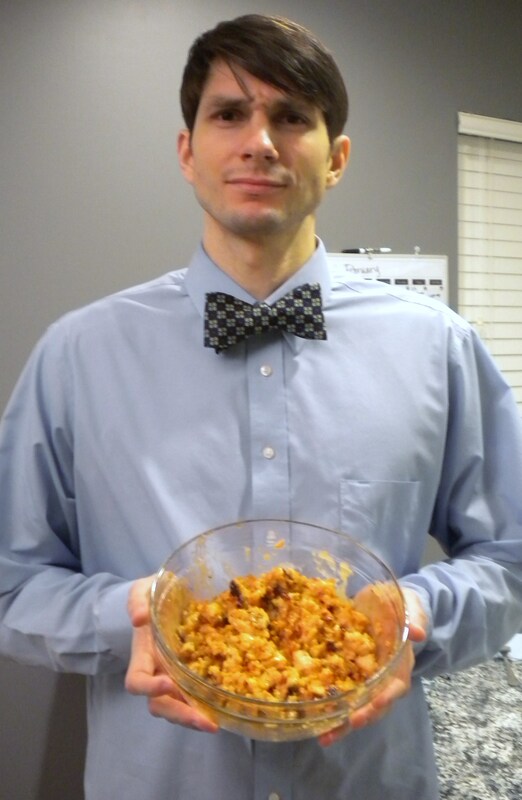 Chris reported that the dish could actually be made with either chicken or shrimp. I picked chicken. 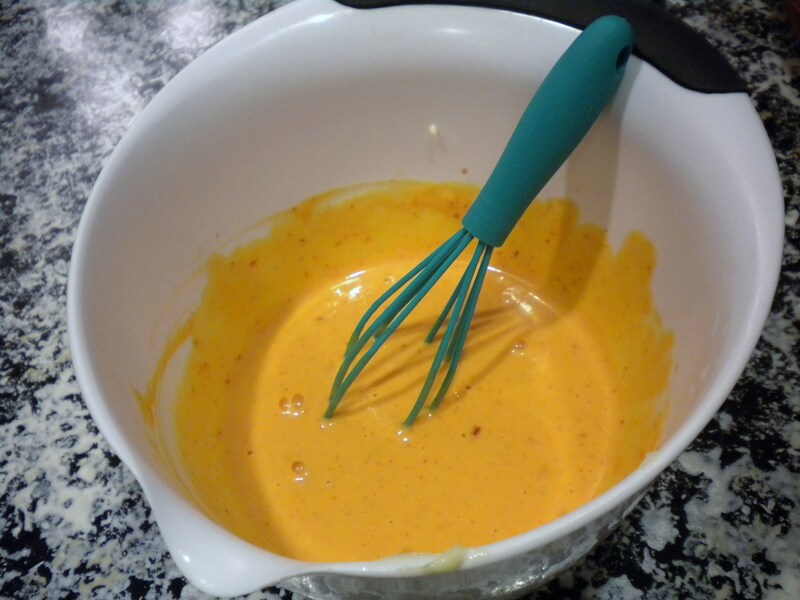 In a bowl combine mayonnaise, sweet thai chili sauce, sarachi chili sauce and rice vinegar. Whisk together until will combined, set aside. Soak shrimp in bowl with milk. Prepare a bowl with panko bread crumbs and another with corn starch. 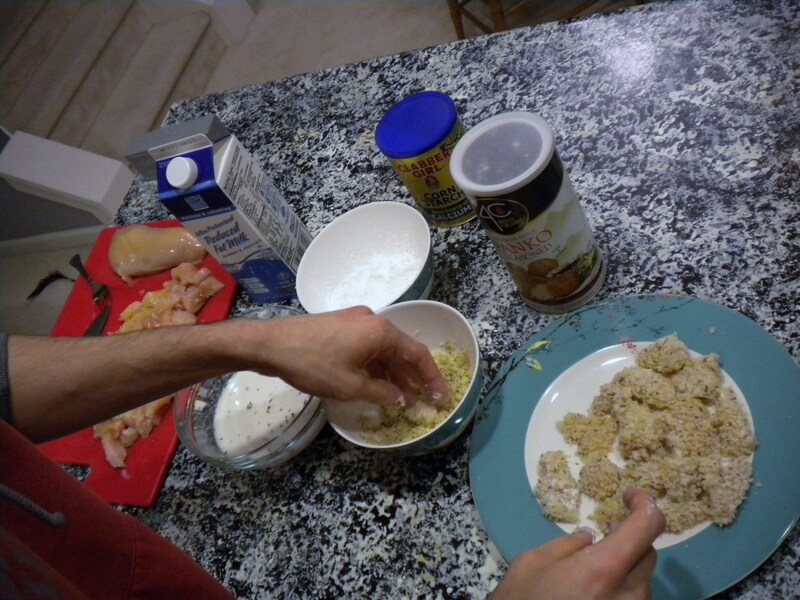 Dredge the shrimp in the corn starch, then again in the milk and finally in the panko bread crumbs, set aside. Heat a large skillet of oil until it reaches 300 degrees. Drop shrimp in and fry until golden brown. Remove from oil with a slotted spoon. Drain fried shrimp on plate lined with paper towels. In a large bowl combine fried shrimp with prepared sauce until evenly coated. Pile high on a bed of shredded cabbage and garnish with scallions. Bang bang sauce. Star of the show. A smidge o’ garnish probably wouldn’t have been the worst thing in the world. As you can see, there aren’t like a lot of steps or anything. It’s pretty much just mixing up some stuff into a sauce and dumping it on some chicken, so it’s kind of impressive that I was able to botch it up. My respect for those with kitchen prowess, such as Hilary McHungerstein, is reaffirmed. I believe my first folly was in the amount of chicken I decided to use. 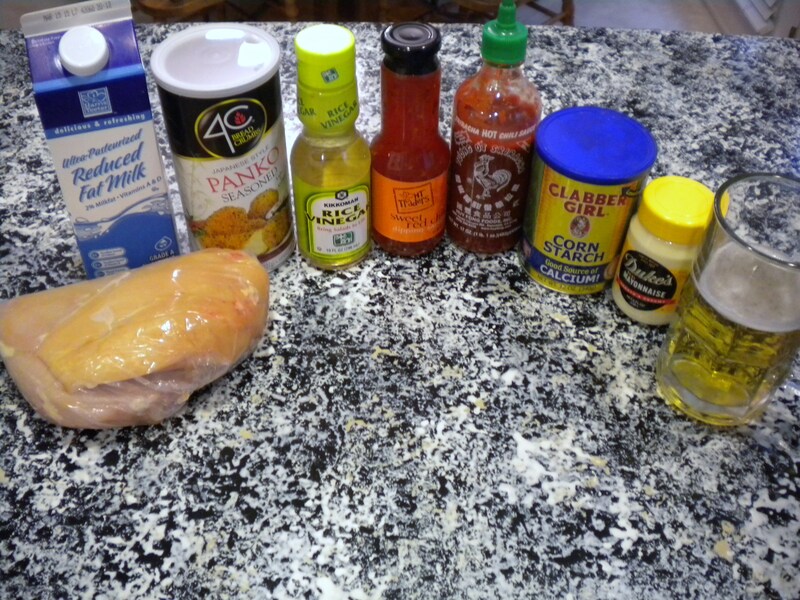 I went with a little over 1.5 lbs of chicken, which meant 2 pretty good-sized breasts. I think that was a little too much. Either that, or I just cut the pieces too small. I feel like the chicken-to-breading ratio was a bit off. I ended up with a giant pile of small, highly breaded chicken pieces. That part takes, forever, by the way, and it is extremely messy (at least my approach was). As I took each piece and dipped it in the milk and then corn starch and back to the milk, I accumulated layers upon layers of globby corn starch to the point that I had little clubs on the end of each finger. My biggest struggle was in keeping these Pankos bread crumbs attached to these little chicken pieces. I thought I was doing a good job of making them sticky with the milk/cornstarch, but the crumbs just seemed too large to adhere, especially during the frying process. As a result, I removed from the pan some minimally breaded chicken and a serving of hashbrowns (the fried Pankos crumbs that had fallen off). Now, let us dive into this frying process a little deeper. How much oil is to be used? I think this question is likely pretty easy for most people with even rudimentary culinary skills. I, however, was unsure. I ended up putting in a good bit of canola, making a little layer over the whole pan, which may or may not have been enough. I think the main problem I had was in trying to cook all of the chicken pieces at once. They filled the entire pan (a pretty big one), and I think this hindered their ability to fry up real nice and get crispy. Consequently, I cooked it for too long trying to achieve an adequate crisp factor, and the chicken got a little tough. Should I have shown patience and fried a few at time? Probs. The interesting thing about the whole venture is that it actually tasted pretty good once the dust had settled. I think that is a testament to the glory of home-cooked chicken and sweet/sour sauces. I neglected to garnish (the recipe called for a bed of cabbage and a sprinkling of scallions), and I’m not afraid to admit that I now regret that. I’ve never been much of a garnish guy–It’s like makeup for food–but it would have really benefited the presentation here. 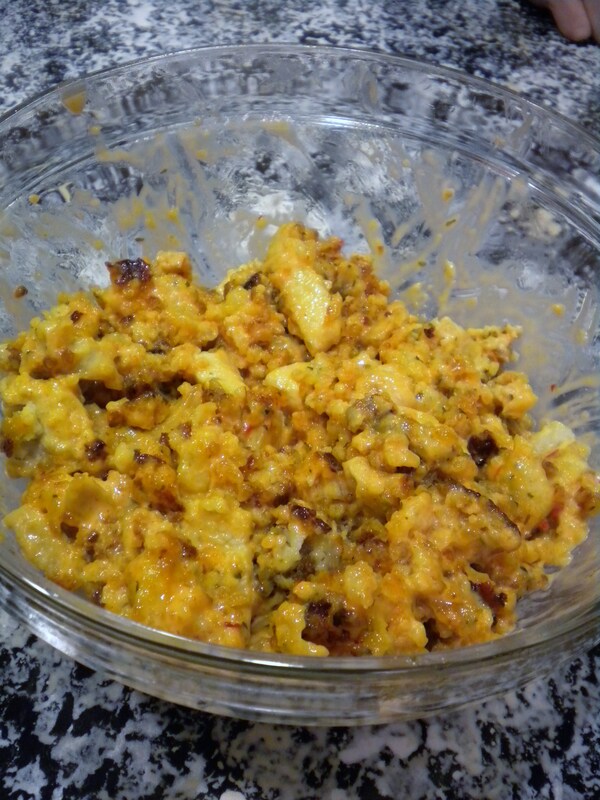 A bunch of gooey chicken pieces in a bowl… maybe they could’ve used the makeup. Anyhoo, thanks for listening, and thanks to the masterblogger Hilary of Hungertown for allowing me a guest entry.